* 160 | Pre-views, level help, tips and videos for ALL Facebook King levels! Level 160 – darned those Doom Skull Bubbles! The Mystery Bubbles in the middle of the level can provide lots of fun, but the level is easiest passed if you avoid them, as they become real trouble if you get a Bomb from them. It can be very tricky to avoid the Doom Skull Bubbles when you do bankshots to get down the middle column of them. 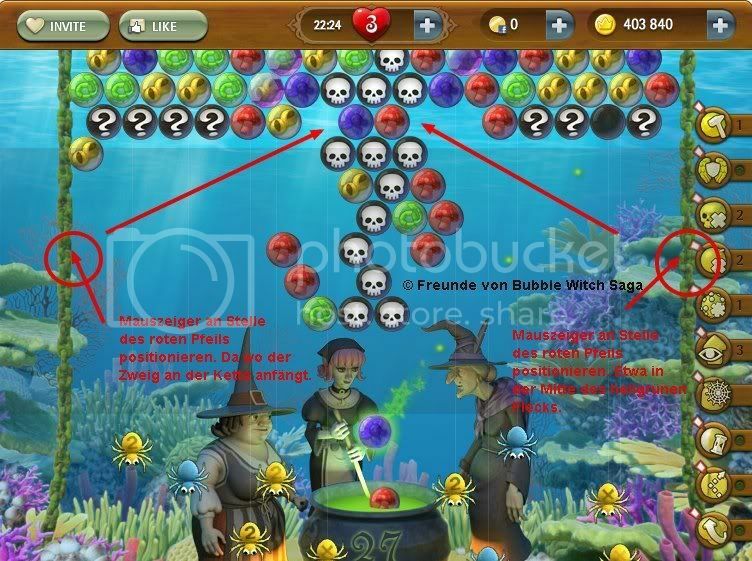 But Stefan Raymond Junker published a great picture with hot spots in his FB group Freunde von Bubble Witch saga. If you put your cursor at the same spot as in this picture, you will not hit any Doom Skulls.